Breast cancer is a heterogeneous disease that develops and progresses because of alterations in genes that control cell growth, proliferation, and differentiation.1 To ensure optimal management, each patient diagnosed with the disease should receive treatment that is guided by the molecular composition of his or her tumor. Although such a scenario is still not fully realized, biomarkers are beginning to play an important role in preparing the way for precision treatment in breast cancer. In particular, biomarkers are increasingly being used to predict patient outcomes and help determine the most appropriate type of systemic therapy to be used. Reflexive testing for biomarkers in newly diagnosed cases of breast cancer includes estrogen receptor (ER) and progesterone receptor (PR) status for selecting patients who should receive endocrine treatment, and human epidermal growth factor receptor 2 (HER2) status for identifying patients who are likely to benefit from anti-HER2 therapy. One of the challenges that many oncology practices face is developing best practices that will allow the efficient and cost-effective incorporation of biomarker testing for prognostic and predictive purposes into the care of patients with breast cancer. The development of these best practices was the focus of an informative and insightful conversation between a pathologist and a medical oncologist. Harris S. Goodman, MD, is a community-based pathologist in San Francisco, CA, who is affiliated with urban, mid-sized hospitals, including Saint Francis Memorial Hospital and Alameda County Medical Center. Alan M. Kramer, MD, is a community-based medical oncologist in private practice in San Francisco. 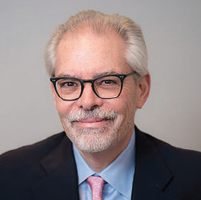 He specializes in treating patients with breast cancer, and is affiliated with several hospitals, including California Pacific Medical Center, Saint Francis Memorial Hospital, and the University of California at San Francisco. In this publication, Dr Goodman and Dr Kramer explain how they work together as part of the cancer care team to deliver individualized treatment to patients. Because these 2 experts are in community-based practices, their perspectives on the development of best practices to effectively incorporate biomarker testing into precision treatment for patients with cancer—especially those with breast cancer—will be of value to other community medical oncologists and pathologists. Biomarkers are increasingly being used to predict patient outcomes and help determine the most appropriate type of systemic therapy to be used. Today, the main challenge for oncologists and pathologists is the identification of the appropriate predictive biomarkers for the selection of optimal treatment. A significant issue related to biomarker testing in patients with cancer is effective communication between the medical oncologist and the pathologist. The experts did not fully agree on the topic of who drives the discussion and makes the final decision about which biomarkers to test in a given patient. This conversation clearly indicated that decisions are made in collaboration between the medical oncologist and the pathologist, with required input from both specialists. How does the discussion occur as to whether biomarker testing in a particular patient is appropriate and which biomarkers are important? The experts explained that these conversations occur during a tumor board, at meetings of cancer committees, and through consultations conducted by e-mail or phone, as well as in person. Time is an important issue for many providers—the time it takes to collect a biopsy specimen and send it to the laboratory; to process the specimen and obtain results from biomarker testing; to interpret results; and to discuss treatment options with oncologists so they can advise their patients. This process typically takes 7 to 10 days or sometimes even longer, depending on the type of testing being performed. If next-generation sequencing (NGS) is included in the testing, the process may take 2 weeks or longer. Although it is evident that associations between relevant genes and corresponding targeted drugs have been discovered, it is also clear that biomarker-guided treatment needs to be cost-effective as well as clinically beneficial to be incorporated into the treatment paradigm for patients with cancer.11 In a recent study, economic evaluations were reviewed for biomarker-drug associations listed in the FDA Table of Pharmacogenomic Biomarkers in Drug Labeling. Of 137 pharmacogenomic associations identified in the table, 57% were economically in favor of biomarker testing, of which 30% were cost-effective and 27% were actually associated with a cost-savings.11 The study authors developed a model for evaluating pharmacogenetics-guided treatment versus standard treatment (Figure).11 This model predicts that if the pharmacogenetics-guided treatment reduces costs and achieves a better clinical outcome than the standard treatment, the pharmacogenetics-guided strategy would be preferred over standard therapy. 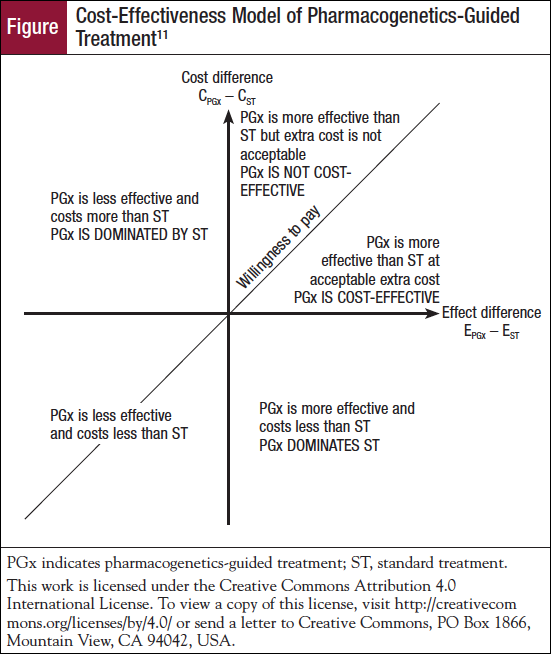 In contrast, if the pharmacogenetics-guided option costs more but is less clinically effective than standard therapy, the preferred option would be standard therapy versus pharmacogenetics-guided treatment.11 When 1 treatment costs more but is clinically more effective than the other, the payer’s “willingness-to-pay threshold” will ultimately determine cost-effectiveness and whether a molecular biomarker test will be covered. Many of the best practices discussed in this newsletter are tumor-agnostic, so that they can be applied to biomarker testing (including NGS and other comprehensive genetic profiling) across multiple tumor types, including lung cancer, metastatic melanoma, breast cancer, and other solid tumors, as well as hematologic malignancies. Because molecular biomarker testing is increasingly being used to inform targeted therapy and immunotherapy in patients with cancer, these best practices are relevant for the entire cancer care team, including medical and surgical oncologists, pathologists, pulmonologists, interventional radiologists, oncology nurses, and other healthcare professionals involved in the care of patients. Toss A, Piacentini F, Cortesi L, et al. Genomic alterations at the basis of treatment resistance in metastatic breast cancer: clinical applications. Oncotarget. 2018;9:31606-31619. Parker JS, Mullins M, Cheang MCU, et al. Supervised risk predictor of breast cancer based on intrinsic subtypes. J Clin Oncol. 2009;27:1160-1167. Prat A, Ellis MJ, Perou CM. 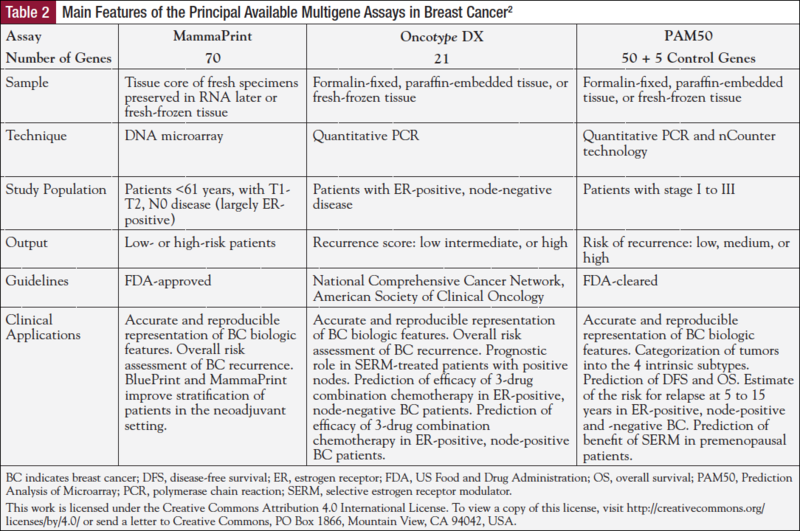 Practical implications of gene-expression-based assays for breast oncologists. Nat Rev Clin Oncol. 2011;9:48-57. Goncalves R, Bose R. Using multigene tests to select treatment for early-stage breast cancer. J Natl Compr Canc Netw. 2013;11:174-182. Chia SK, Bramwell VH, Tu D, et al. A 50-gene intrinsic subtype classifier for prognosis and prediction of benefit from adjuvant tamoxifen. Clin Cancer Res. 2012;18:4465-4472. Filipits M, Nielsen TO, Rudas M, et al. The PAM50 risk-of-recurrence score predicts risk for late distant recurrence after endocrine therapy in postmenopausal women with endocrine-responsive early breast cancer. Clin Cancer Res. 2014;20:1298-1305. Soukup T, Lamb BW, Sarkar S, et al. Predictors of treatment decisions in multidisciplinary oncology meetings: a quantitative observational study. Ann Surg Oncol. 2016;23:4410-4417. Wu Y, Meng Q, Yang Z, et al. Circulating HER-2 mRNA in the peripheral blood as a potential diagnostic and prognostic biomarker in females with breast cancer. Oncol Lett. 2018;16:3726-3734. Ruan M, Tian T, Rao J, et al. Predictive value of tumor-infiltrating lymphocytes to pathological complete response in neoadjuvant treated triple-negative breast cancers. Diagn Pathol. 2018;13:66. Verbelen M, Weale ME, Lewis CM. Cost-effectiveness of pharmacogenetic-guided treatment: are we there yet? Pharmacogenomics J. 2017;17:395-402.